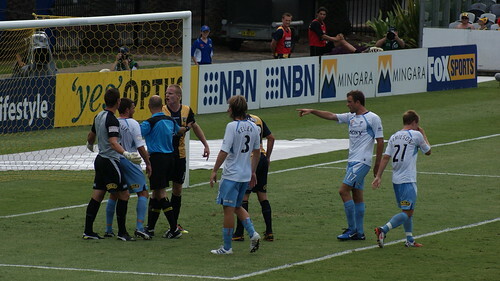 EDIT: On 24/01/11 Liam Reddy was handed down a two match suspension, the decision accepted by Sydney FC. What can only be described as a ‘right hook’ could land Sydney ‘keeper Liam Reddy in strife, a visit to the Match Review Panel almost certainly on the cards. Reddy clashed mid-air with Matt Simon in the 37th minute of the game at Bluetongue Stadium on Sunday. As the pair fell together in a heap, Reddy allegedly punched Simon in what appeared to be the stomach. Questions regarding the incident came as a surprise to Sydney coach Vitezslav Lavicka, who was unaware of his players indiscretion. “I don’t know what you mean? I didn’t see that moment. It was a tough challenge between their striker and our ‘keeper – hard to say”. It was no such surprise for Simon, who took the rough play in his stride. “It seems to be always a battle when I’m playing! I enjoy that sort of stuff as everyone knows – you just get on with the game. “I cop heaps every game don’t I?” said Simon. Mariners coach Graham Arnold also weighed in on the incident, jovially desiring repercussions. However, a composed Simon didn’t seem to want to take matters further. Next week the Central Coast face off with Adelaide United in what will be a defining moment of their season. A win here would give the Mariners a four point advantage over third placed Adelaide. Graham Arnold had some short yet powerful words for the Reds, who will be confident after their 8-1 drumming over North Queensland Fury this week.